Our second Blended panel was held at the co-working space Bamboo Detroit last month to have a discussion around multicultural marketing in the automotive industry with a focus on Detroit. Unlike traditional marketing panels, our event featured panelists with roles in the auto industry whose functions overlap with marketing, or at least require marketing to stay top of mind when executing daily tasks. The general consumer market has become equivalent with the multicultural market. How is this reflected in the auto industry? Talk about what strategies you use to be all things to all people — to appeal to one audience, without alienating another audience. How do you make it work for everybody? 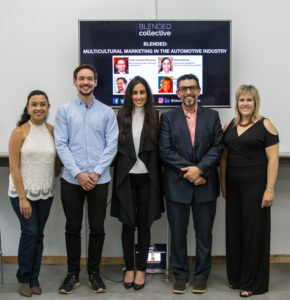 Can you give an example of a company outside of automotive you find successful at multicultural marketing, which can be translated to the auto field? This event is part of our quarterly speaker event series. The next Blended panel will take place on September 5, 2018 in partnership with Detroit Design Month about The Intersection of Culture x Design. Let’s keep the conversation going! Share your thoughts on Instagram, Facebook or Twitter using the hashtag #BlendedCollective.